Park Board members, Roger Brocious, John Cook, Director Roger Van Frank, Elaine Holzapfel, Bob Nelson, and Tina White, during the acceptance and sign unveiling during the Park District Board of Trustees meeting in December 2018. GREENVILLE — Darke County Parks recently was recently gifted a two-acre parcel of land by Elaine Holzapfel. 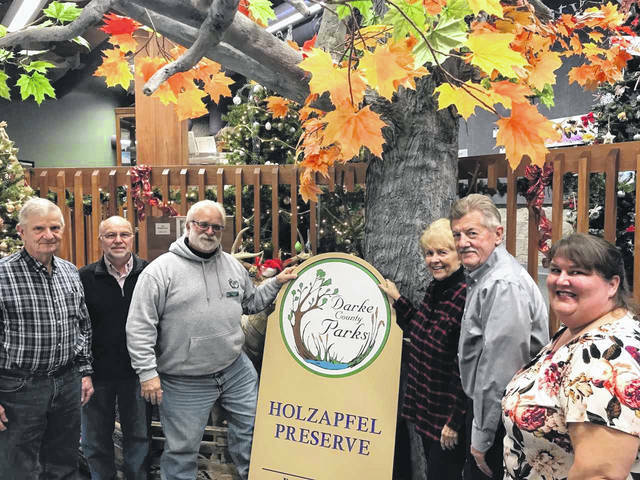 Holzapfel has created and worked on the tract of land for well over 10 years, creating an arboretum, a botanical collection composed exclusively of trees, in anticipation of this gift. “I have thought about this preserve for several years now and have worked to have an arboretum type of plot in the middle of Greenville for all to enjoy.“ Holzapfel said. This gift of land will be used for educational purposes, with an emphasis for the local Greenville School District, as a hands-on example for the stewards of tomorrow. “The district hopes to add tree identification placards and to offer tree identification classes for the public and students in the future,” said Chief Naturalist Robb Clifford. The Holzapfel Preserve will open this summer, following the construction of a small parking lot off of Meadow Lane. If you would like further information on this or any other upcoming programming, please contact the Darke County Parks, at 937-548-0165, or online, at darkecountyparks.org. https://www.sidneydailynews.com/wp-content/uploads/sites/47/2019/01/web1_parknews.jpgPark Board members, Roger Brocious, John Cook, Director Roger Van Frank, Elaine Holzapfel, Bob Nelson, and Tina White, during the acceptance and sign unveiling during the Park District Board of Trustees meeting in December 2018.